With holiday parties and end of year functions to attend, there's no more fun time to frock up in a glamorous gown. No 1: Reformation Sophia Dress. Reformation kills it in the glamorous, conscious fashion stakes. And with pieces like this floor length gown, it's not hard to see why. The long wraparound style makes it perfect for holiday twirling. Sustainability is one of the main driving philosophies of the Reformation business model. The environmental "cost" of a garment is considered from fabric, through to the way fabric is cut to minimise wastage of water, energy and materials. Many garments are made from dead stock. Reformation list the impact each of their garments have on the environment on their website. All garments are made in Los Angeles, by sewers being paid above award wages. Currently, Reformation recycle 75% of their garbage, with the goal to work towards 100%. Garment scraps are either recycled or donated wherever possible. No 2: Megan Park Chikankari Crepe Dress. Megan Park is a Melbourne based designer who celebrates the role of the artisan in producing hand embroidered and hand made pieces. 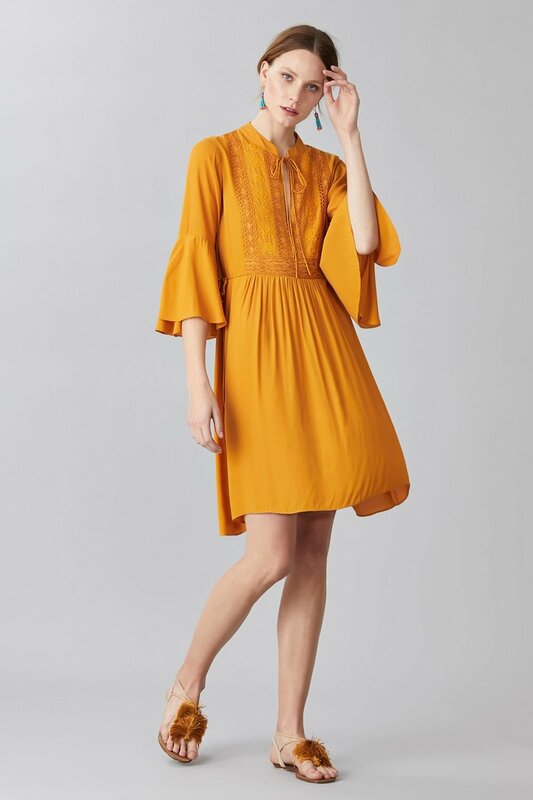 While the brand does also carry silk, the majority of pieces are made from cotton, and are made in India in Megan Park's own factory, by artisans who have been making her garments for many years. We love the Chikankari dress because it is the most luscious saffron colour (and if you can't wear gold at Christmas, then when can you?) and because of the gorgeous embroidery detail on the bodice, which apparently takes 10 hours to produce. That makes it wearable art, and a piece to be treasured in any ethical fashionista's wardrobe for many, many years. Made from vegan materials (100% viscose, a plant fibre with similar hand feel properties to silk). Each garment is made by the same tailor or embroiderer from start to finish, so there is a sense of pride and ownership imbued in every exquisite piece. Megan Park garments have a reputation for longevity. Quality fabrics, quality threads and artisan stitching come together to create garments with a longer life span than fast fashion clothes. No 3: Echo + Air Dahlia Dress. Echo + Air garments are designed and sewn in Los Angeles, from eco-conscious fabrics, using Japanese cutting techniques. We love the voluptuous shape of this Dahlia dress, placing emphasis on the draping qualities of silky soft Modal, a fabric made from tree fibres. Made from vegan & eco friendly materials. Fabric is Modal blended with some Spandex for stretch. Echo + Air is a LA based label who manufacture locally using eco-conscious textiles and small run batches. No 4: Milo + Nicki Fiesta Dress. This one might just be our favourite of the quad, because the Fiesta Dress is made from fabric made from... banana fibre! Yep, the dress is made from handwoven banana fabric, which is then hand-dyed with plant based dyes. The pockets are made from GOTS organic cotton. We also love the cut, with a drawstring neckline allowing it to adjust from off the shoulder, to on the shoulder, making the asymmetrical one-shoulder design even more versatile. And can we talk about that colour??? Both Henrietta and I gravitate to anything in blue, so this party dress has got sparkle written all over it. Made from banana fibre fabric, with organic cotton pockets. Hand dyed with plant based dyes. Made in NYC from fabric hand woven in India with fair trade certification. All labels, hang tags and packaging is made from recycled or recyclable materials.